Travelling just got cosier with this custom neck pillow. Printed all over with your unique designs, it's the ultimate way to sleep in style. Made using soft suede vision fabric and plump padding in a classic U-shape, your personalised travel pillow supports your head so you can doze off comfortably on long journeys. From head to toe, make sure your travelling style is on point with a personalised travel pillow. The ultimate accessory for any long journey, you can sleep in style and cosy comfort. Unlike plastic blow-up neck pillows, this one is made using sultry suede vision fabric, so it feels lovely against your skin, and the thick, sumptuous padding gives you unlimited support without the worry it's going to deflate - so you can say goodbye to stiff necks. If you're going on a plane journey, they can easily be packed away due to the spongy nature, you can either store it in your hand luggage ready for taking off or wear it through the check-in gate. Design both the front and back with your photos and enjoy a fashionable flight or fun car journey. The neckpillow came as I expected. Totally happy with the whole experience of purchasing it . The product was everything I wanted it to be. The design process was easy to use and it was helpful to know when pictures were not of good enough quality. The end product is of good quality and exactly as I ordered. Was worried about the quality of the product but feels great and the picture quality came up really well. Bought as a present. 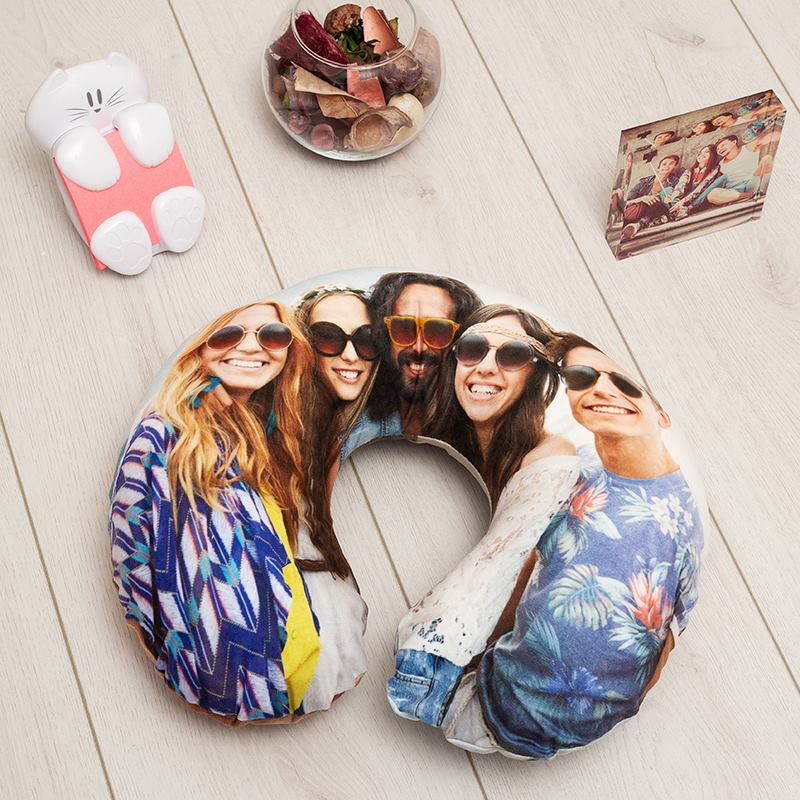 Like many of our products, the personalised travel pillow comes with a quantity discount, so when you buy two or more, the price per pillow is cheaper. This is perfect if you're looking to design one for all your family members. Design your own neck pillow for travelling and enjoy snoozing in style and total comfort. We only use the highest quality material, from the suede vision fabric to the thick, plump stuffing. Your photos are printed onto the fabric, which is then cut to size and hand sewn to form the classic U shape. A zip is sewn into the top, finished with a stylish heart pendant for that extra bit of glamour. The print quality is so sharp, with colours bright and details almost high definition. Your custom neck pillow really is a gift for life, as the designs won't peel away, scratch off over time, as the inks are fused deep into the fabric fibres. Every trip you make, you can get there in style, and without a stiff neck. Care: The mock suede cover is removable and can be machine washed at 30°c, tumble dried or left to dry flat. The fabric itself is fire rated with water repellent qualities, so in between washes, give it a surface clean with a damp cloth. Even with washing and frequent use, the print won't peel over time. Repeat patterns or photos with large details work best on the personalised travel pillow, to guarantee your design stands out in the crowd - ideal for children who can easily be lost in an airport or ferry. As both sides are customised, you could create two entirely different looks, maybe one with a winter theme and one with a summer theme, so you can always be coordinated with your destination. Make travelling a fun experience with a travel pillow personalised especially for your little ones. If they get nervous going on an aeroplane or get bored during car/train journeys, this is a way to encourage a positive attitude. Printed with their individual names and a favourite photo, they'll be excited to go on adventures. If you're a frequent flyer for business reasons, why not extend the reach of your marketing and print your company's logo? It's added exposure and ensures you look super professional at all times. With a base colour to suit the business' branding, it's a smart and stylish travel accessory. To celebrate all your fabulous holidays you've experienced, create a long-lasting memory in the shape of a personalised travel pillow. Printed with an eye-catching photo collage featuring your favourite pictures, you'll be able to reminisce and get excited for your next adventure when travelling. Make your next trip abroad even more special by designing your own passport cover. A memorable 21st birthday gift they will love.